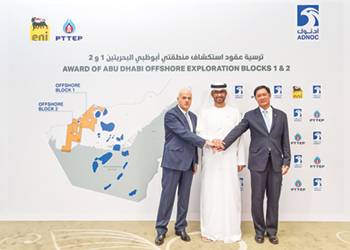 Abu Dhabi National Oil Company (Adnoc) has awarded two offshore blocks, covering a combined area of more than 8,000 sq km to a consortium led by Italy’s ENI and Thailand’s PTT Exploration and Production (PTTEP), following a competitive bid round. The blocks, called Offshore 1 and Offshore 2 in the emirate’s northwest, are the first to be awarded among the areas Adnoc offered for commercial bidding as part of Abu Dhabi’s first-ever competitive open block licensing round that began in April 2018. Under the agreement, Eni will operate the areas and PTTEP and Eni will invest at least $230 million for oil and gas exploration. The two companies will both hold a 100 per cent stake in the exploration phase. Adnoc has the option to hold a 60 percent stake in the production phase, following any commercial discovery. The concession agreements were signed by Dr Sultan Ahmed Al Jaber, UAE Minister of State and Adnoc Group CEO; Claudio Descalzi, CEO of Eni; and Phongsthorn Thavisin, president and chief executive officer of PTTEP. Meanwhile, Adnoc has been named as the most valuable brand in the Middle East region by Brand Finance, the world’s leading brand valuation and strategy consultancy. Adnoc is the first regional oil and gas company to be featured in the annual Brand Finance Global 500 report with a brand valuation of Dh32.69 ($8.9 billion).